Having received my AJ-PX270 last Friday I have had a roller-coaster weekend getting to know the camcorder with some surprising results. The camera is heavier than I was expecting which is a good thing…well built and well thought out ergonomically, finally we get an automatic lens hood getting away from the dangling lens cap seen on the AC8. 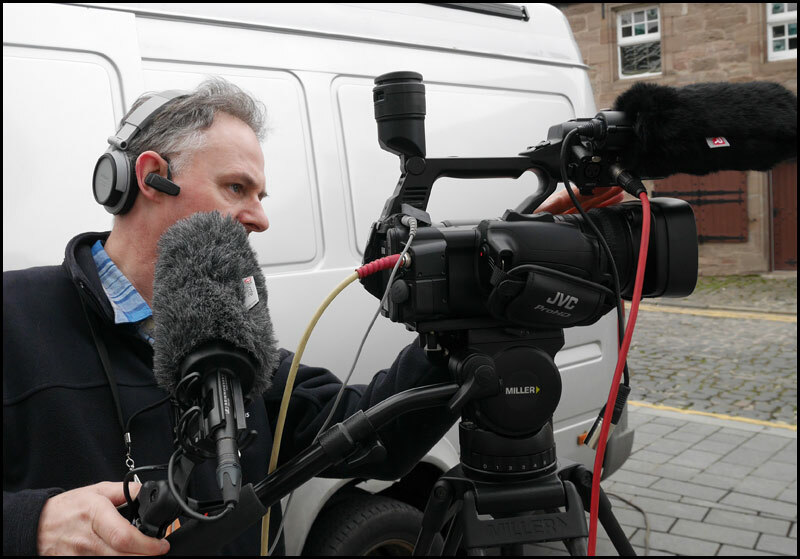 My good friend Alister films theatre shows all over Scotland with two Sony EX3 cameras into a Panasonic switcher ending up onto a Sony EX30 digital SxS recorder. 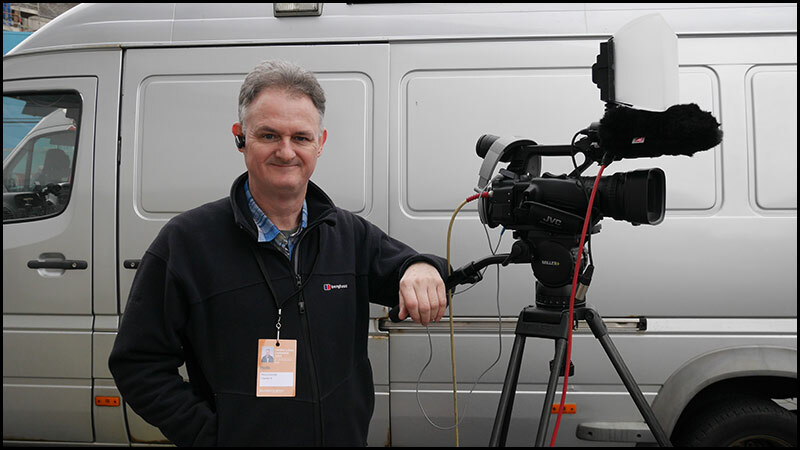 Alister is hoping to upgrade this year and is looking at two Panasonic PX270 camcorders as a replacement for his second 2 camera kit, Sony NX5 camcorders. The Panasonic PX270’s 10bit 422 via Long GOP 50 onto SDXC cards is very tempting in fact he discovered his switcher is already 10bit and has a HyperDeck Studio which is 10bit 422 giving him a clear 10bit 422 pathway from camera to recorder. I recorded some footage to include in the review and tomorrow we are going to see how the camera matches up to the Sony EX3 and NX5. One final major game changer surprise is that the Panasonic PX270 has a far better………….? Oh dear have I missed out something, the major surprise will be exclusively revealed on the video review coming fairly soon. I say fairly because Long GOP 50 is not yet available in FCPX 10.1.1 and I am hoping Apple will include this codec in the NAB update due soon. If you film 720p you can ingest your footage via the HDMI socket into Blackmagic Media Express, its a laborious way to capture footage so I may sit tight till the new update arrives for FCPX. 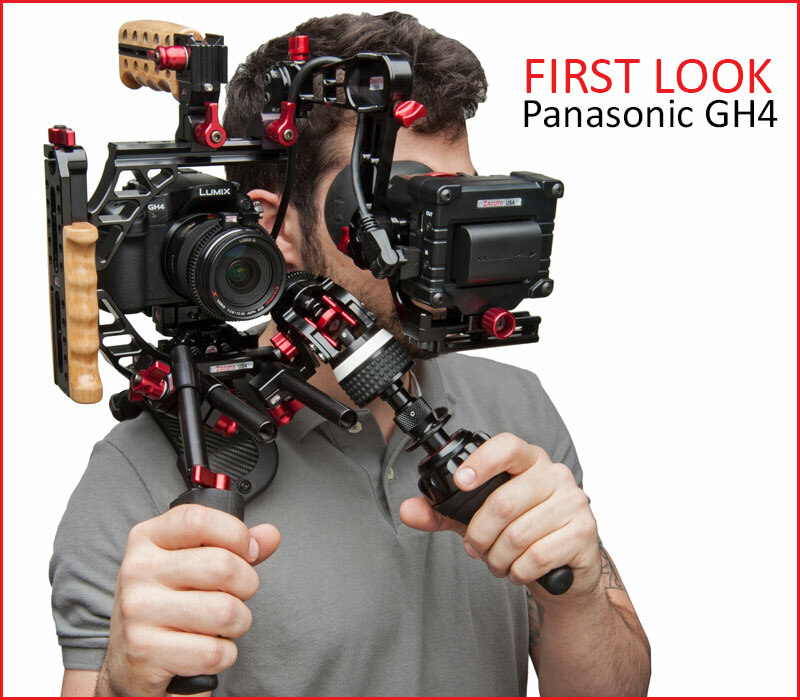 “One of the big defining characteristics of the new Varicams is their modular style. The cameras and recorder are separate, with the recorder being dockable to both cameras. The cameras have received a lot of attention already, but I would like to again explain about them. One is the 4K camera module, which has a Super35-sized sensor and a PL mount. Next is the 2/3” HD camera module, which has a 2/3” sensor set and can shoot FullHD up to 240fps. The recorder module is a very powerful unit capable of recording in a variety of formats, including 4K and high frame rate FullHD. Besides the convenience of being able to use a single recorder for the two different camera heads, the Varicam’s modular set up allows the camera and recorder to be separated, connected by a single cable. When shooting in tight quarters, on a crane, etc, room need only be made for the camera, with the recorder located somewhere with a bit more space. Please note, however, that the camera heads cannot be used without the recorder, and the recorder can only be used with the Varicam camera modules. The ZEISS Compact Zoom lenses are the only cine-style zooms in the world with full-frame coverage. All three zooms were calculated for the full-frame format of 36×24 mm. As a result, they are also compatible with image sensors larger than Super 35 (ex: image diagonal 31.5 mm) and therefore already ready to accommodate future developments in the field of growing sensor sizes. When the lenses are used on Super 35 cameras, users benefit from the positive “sweet-spot effect”: the image circle used by the sensor comes from the inner circle of the lens. As a result, the lens only uses that part of the illumination that has the highest quality in terms of sharpness, light and contrast. In line with the reliable and strict quality requirements that ZEISS lenses are subject to, all three representatives of the Compact Zoom family enable 4K capture. All three lenses – the new Compact Zoom CZ.2 15-30/T2.9, the CZ.2 28-80/T2.9 and the CZ.2 70-200/T2.9 – will also be available as a complete set (without transport case) for € 44,999 € or US$ 59,900 (excl. VAT)*. As a launch promotion, ZEISS is offering in the United States and Canada an attractive financing program for the new cine zooms as well as the Compact Prime lenses: 0% interest for 12 months with a zero US$ down payment. Six months ago the BBC embark on a new “perspective” for news programming using a Hexicopter, the photograph above although nothing to do with the BBC is a sobering picture of how it can all go so badly wrong, a RED Epic and expensive lens bites the dust fortunately not hitting anyone on its way down. The BBC fortunately have made sure the chap piloting their hexacopter has been fully trained and has a CAA licence. Although this story is 6 months old its very relevant to the ongoing saga about “drones” and people flying them with and without CAA licences. I say “I” but there is a fantastic team involved. All I did was stand there trying not to fluff my lines while the hexacopter – a multi-bladed lump of carbon and titanium, sounding like a swarm of bees, flew towards me before catapulting itself into the sky. The pictures speak for themselves. You cannot get shots like that with a helicopter, or a steadicam, or a boom, a jib, a dolley, a cream bun. OK, I made that last one up but you take the point. This machine is unique in being able to go close to something then soar into the air in one smooth movement. It can creep along the ground, shimmy a fence, crawl through a tree then climb to 400ft (120m) for a spectacular panorama. As television and online journalists, we are very excited about its scope to change the perspective of our films. Hexacopter is run by a team from the Global Video Unit, part of BBC World Service Language Services. This was the first time everyone had used it so there were a few nerves fluttering around. Our pilot, Owain, spent six months training for a special licence. There is another pilot, Tom Hannen, and between them they gave birth to the thing, building it before learning to fly it. This is not the kind of machine you pick up in a shop – the kind of thing I have bought in the past and then flown into a tree. 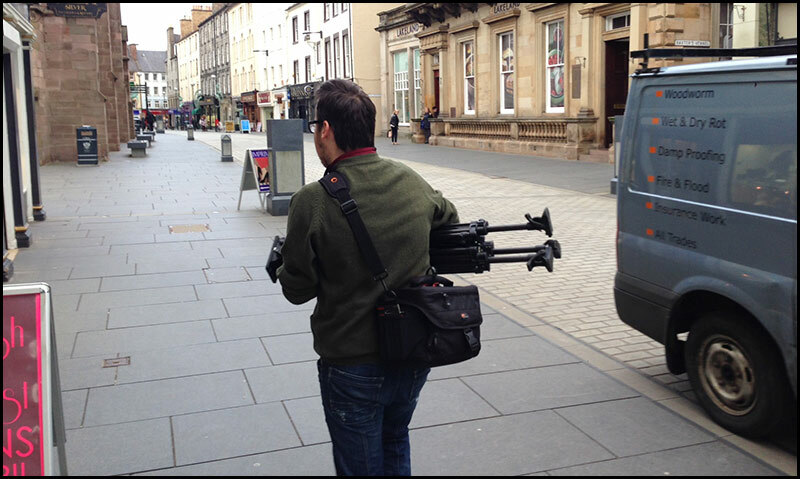 Owain has got his hands full with the flying so he is helped out by a camera operator, Rhian. They have to be in tune for the best results, like circling your stomach and patting your head at the same time. The first problem we had was the weather. There’s no real point in flying if the wind is gusting above 20mph (32kph) and we were right on the limit. The camera is mounted on a gimbal, a pivoted support that allows it to rotate, that keeps it steady even when the chopper is dancing around. Have a look at how smooth the shot is, and that’s despite the fact that the hexacopter was being tossed like a feather on the wind. In the end, we figured that the best way to milk the machine’s capabilities was to use it to surprise the viewer. When the camera first comes out from behind the barrels, and points at me wearing my orange outfit, we hope you think it is just a person walking along with a camera on their shoulder. Then comes the reveal. The camera takes off, flies over my head and climbs above the rail yard, just as a train is pulling out. Confession time now. 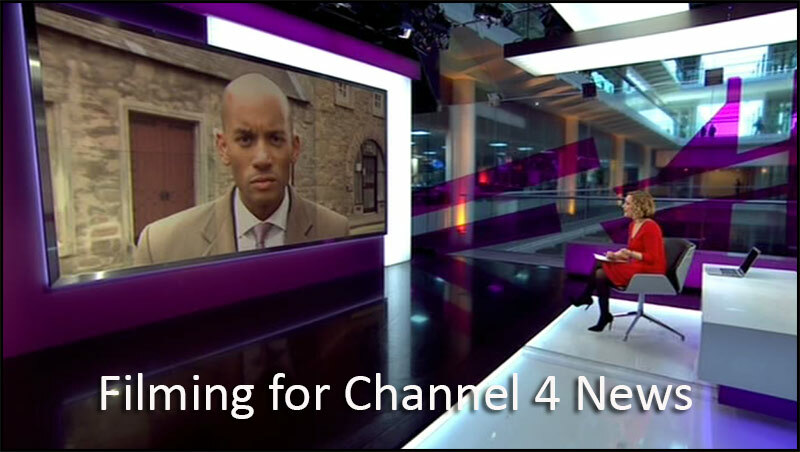 It took a long time to get that 20-second piece of telly right. Three or four hours, although that only includes 40 minutes flying time, 10 minutes per battery. That is a long time for news, but we were on a steep learning curve. And there is another problem too. The noise of the rotors, the bee swarm problem. We have had to cheat the sound a bit to quieten it down. Credit here goes to my producer Jonathan Sumberg. Now, you might be thinking that this is a little bit sinister, potentially. That hexacopter could soon be flying over your head, spying. It also means we have to log a flight plan before every take-off. As an extra safety layer, there is a GPS-based system on board that ensures that if the radio link breaks down between the pilot and the machine it automatically flies back to where it took off from, and lands. This was just our first go, which is why it took four hours to get the opening sequence right – but I admit we all absolutely loved using this machine. Believe me, it will transform television and online news. The hexacopter is able to take a camera to places it has never been before, giving people a whole new view on the world. And we are very excited about that. Remember the ICE Light is £399 incl vat plus carriage. Filming the interview with broadcast cameraman Allen McLaughlin for the Sony HXR-NX3 User Review. This is the first camcorder to date that Sony have not provided a battery or charger keeping costs down to a minimum. The NX3 takes Sony’s “L” type InfoLithium batteries (NP-F979) £114 incl vat and you will also need to order the AC adapter/charger kit (ACC-L1BP) £252 incl vat if you don’t already have these items. 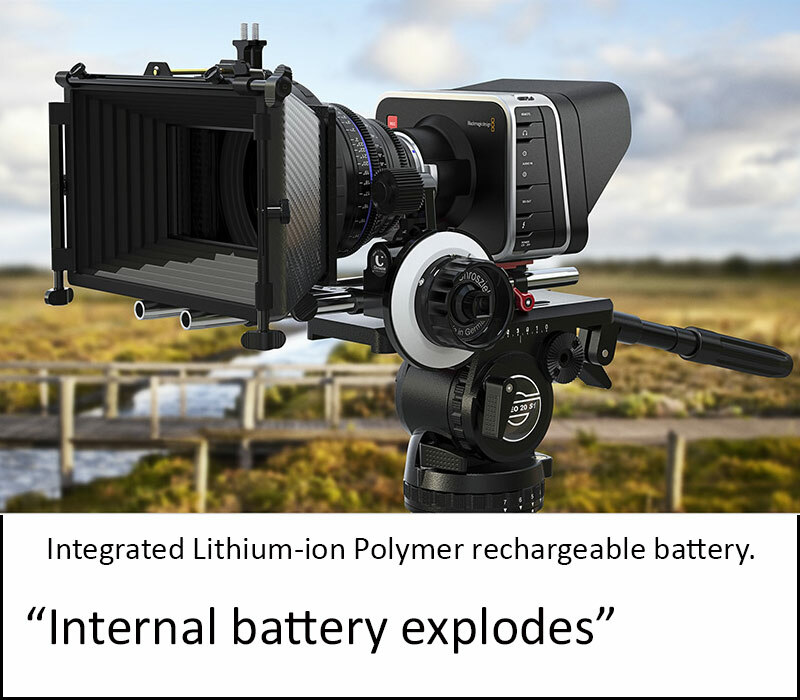 It has been reported that an internal battery in a BlackMagic Cinema Camera has exploded fortunately no one was hurt in the incident. This has brought into sharp focus how we all take L-ion batteries so much for granted and in my opinion is no bad thing if it stops people buying cheaper alternatives. Back in the 1980s Ni Cad battery belts like the one shown above were the norm as camera batteries did not hold their charge and lasted about 20mins. Ni Cads are actually safer than L-ion and if charged correctly do not hold any memory as this was a myth banded around by jealous lead acid manufacturers during the 1980s. I recently swapped out my son’s L-ion battery from his MacBook Pro as it had swollen so much the battery lid would not close. What do Apple, Sony, Dell, Acer, Lenovo and HP have in common? They all make laptops, sure, but each has been forced to recall their laptop batteries because of the risk of fire. In fact, since 2002, there have been more than 40 recalls due to explosion or fire risk from lithium ion batteries in laptops, phones and other electronic devices. And when lithium ion batteries fail, they can do so in spectacular fashion. As the video below from computer support company PC Pitstop shows, lithium ion battery fires not only burn extremely hot (up to 1000 degrees fahrenheit), but can explode, sending chunks of burning metal across the room. Lithium ion batteries have circuitry inside to prevent overcharging and short circuits, but if this circuitry is damaged, the battery could become overheated, resulting in a process known as “thermal runaway.” Thermal runaway is a chemical process where the battery generates heat, causing additional reactions that generate more heat, and so on until the entire thing finally erupts in flame. Manufacturing defects can also result in thermal runaway. How much heat it takes to get a battery to go into thermal runaway may vary based on the type of battery. According to Tony Olson, CEO of D2 Worldwide, which conducted the lithium ion battery test for PC Pitstop, thermal runaway can occur if the battery is heated to anywhere from 140 degrees fahrenheit up to 350 degree fahrenheit. Not standard household temperatures, obviously, but possible if the battery experiences a failure. While the likelihood of lithium ion battery fires is still very low, two factors are increasing the risks. First is the simple fact that it’s becoming far more common for us to own devices containing lithium ion batteries, including laptops, tablets, smartphones, Kindles, etc. Secondly, as manufacturers are pushing to put more and more power into these devices, the results of a failure become more pronounced. Only purchase batteries and chargers directly from the manufacturer or from a manufacturer-recommended source. Buying counterfeit or poorly manufactured batteries increases the chance of having an issue. 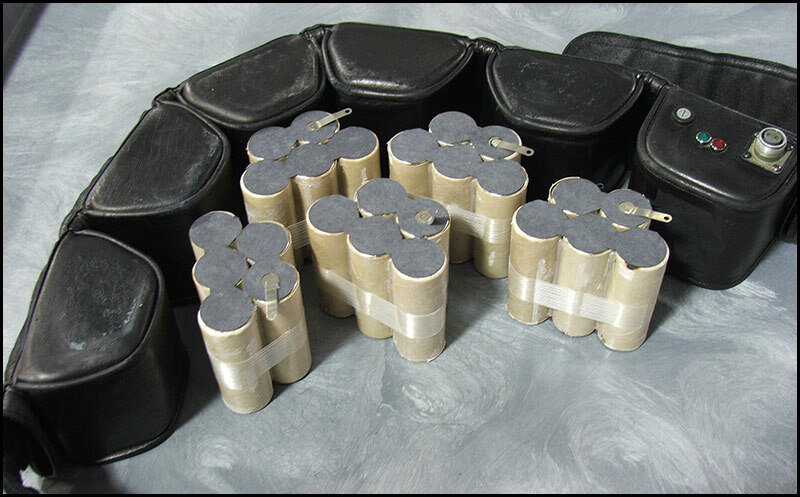 Do not let a loose battery come in contact with metal objects, such as coins, keys, or jewelry. Metal objects can cross the electrical connections and cause an incident if the internal protection circuitry isn’t functioning correctly. Do not crush, puncture or put a high degree of pressure on the battery, as this can cause an internal short-circuit, resulting in overheating. Do not place the phone or batteries in areas that may get very hot, such as on or near a cooking surface, cooking appliance, iron, radiator or the dashboard of your car in the summer. If you drop your phone or laptop on a hard surface, it can potentially cause damage the battery. If you suspect damage to the battery, take it to a service center for inspection. If your phone gets wet, even if the device dries and operates normally, the battery contacts or circuitry could slowly corrode and pose a safety hazard. And if you see any bulging, leakage or other abnormality from your battery, stop using it immediately. Lastly here is whats left of the SSD drive in the BlackMagic camera, unusable. 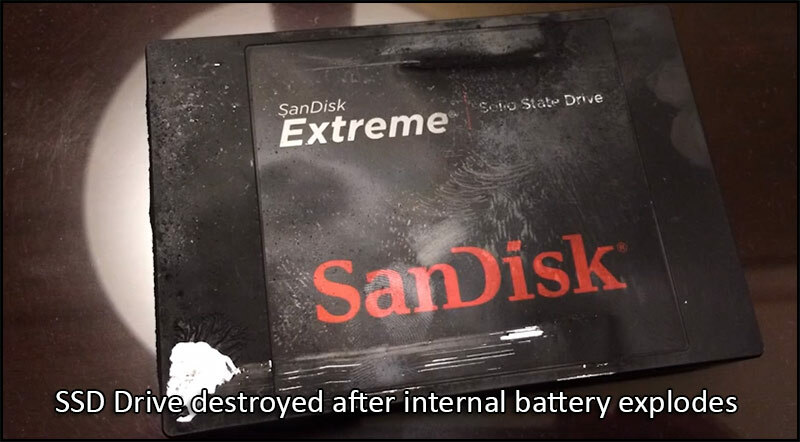 Mr Forrest Gibson…”After getting footage for the Kickstarter video for my new game, my Black Magic Camera’s battery exploded, spewing smoke violently. We ran out of there for safety reasons. However, knowing we had to get some footage of it, we put damp rags over our mouths and ran back in to grab some footage. I was running a “Switronix PB70-BMCC PowerBase-70 Battery Pack for Blackmagic Cinema Cameras” connected to the camera while filming. Right as the camera start spewing smoke, I ripped the battery off in fear of it catching on fire too. The room was cool, the camera was not close to any hot lights or in direct sun, the camera and battery were 7 months old, I had been shooting for about 20 mins and had just stopped recording when this happened. HDW : I know myself that from time to time you can drop your batteries on the floor, I have two such batteries, tomorrow they will be disposed of…safely. I was a bit sceptical at first using the ICE light, one hour of battery light and would it power up once the battery was dead. This is a picture of Rachael without the light, not bad but I would prefer some fill from the right side of her face. The ICE light does the trick because its diffused you get a lovely soft light…the same as the daylight coming in on the left. I took time to show Rachael the pictures as she was keen to do her best. Strangely you hold the “ON” button to power up and press the off button briefly to switch it off. Once again this picture is more than acceptable and this time I have a 2700K light coming from behind Rachael. The ICE light brings the same picture alive along with the 2700K back light, I was also using my GH3 with my Leica 42.5mm f1.2 lens…stunning. This was taken with the Panasonic GM1 just to show you the setup but note how little space the ICE light takes compared to an LED panel. 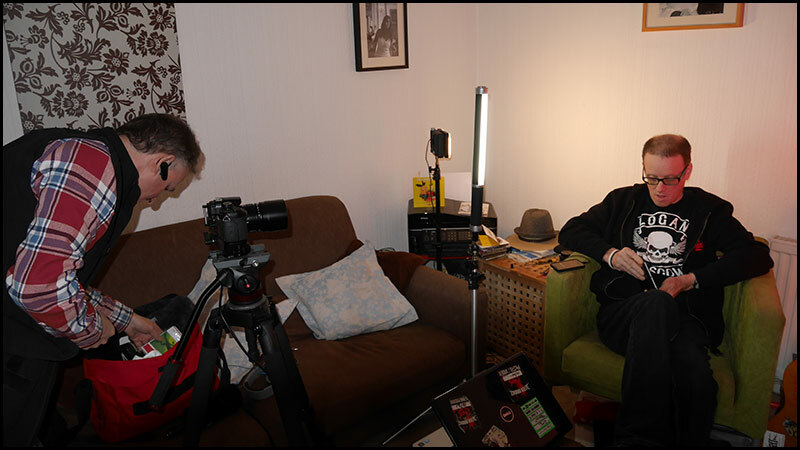 I used the ICE light to film my interview with Allen who has just taken charge of a Sony HXR-NX3. 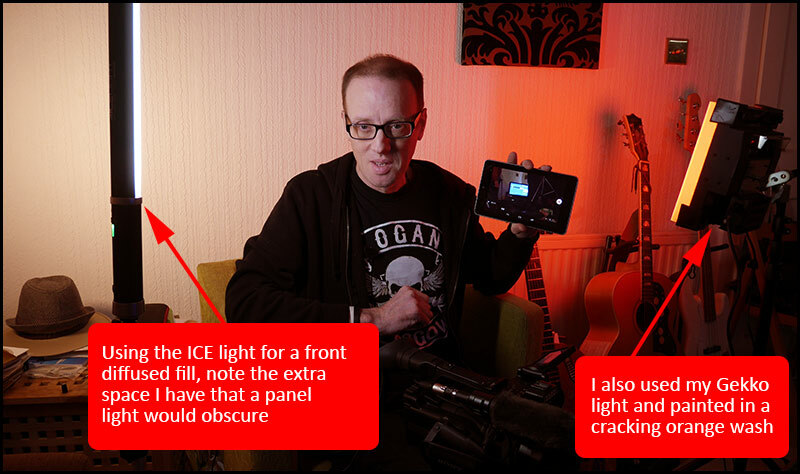 The ICE light is great for video work and has a dimmer, I did a test this morning and to my surprise the light stayed on at full power for one hour, thirty minutes, you get a colour change on the unit from green, orange to red when the light is almost empty. 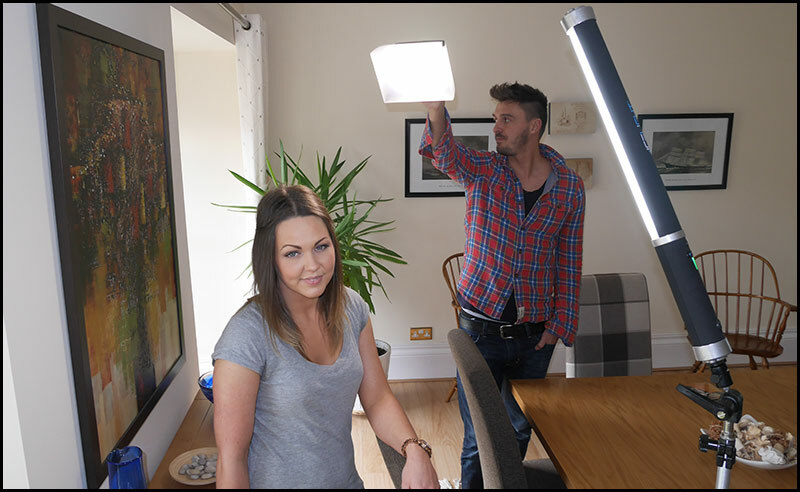 I also have a third light to the left of frame giving me a 2700K wash behind him. After the battery died I tried it on the mains and yes it lights with no battery power a major bonus. 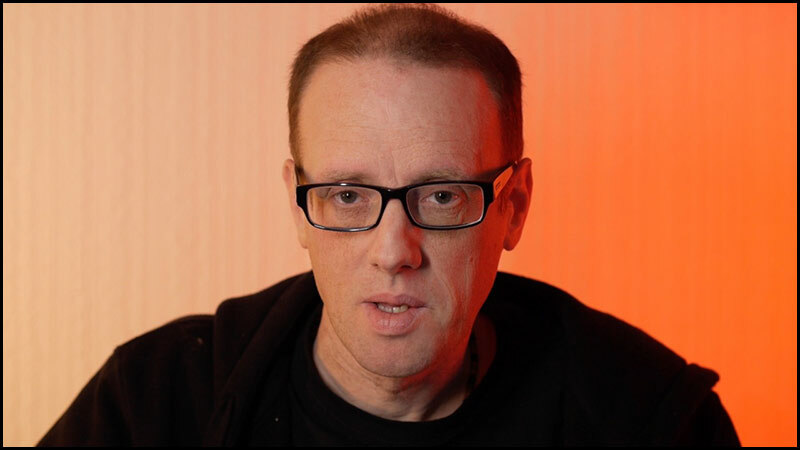 This is the final screen grab from the GH3 of Allen’s Sony HXR-NX3 user review. Allen is a broadcast cameraman and is off his work with a serious foot complaint but was delighted to take part as it kept his mind off his foot. The interview was filmed using the Panasonic GH3 with a 42.5mm f1.2 Leica lens (35mm equvelent = 85mm). Sound was via the Tascam DR60 and a Rode lapel mic. 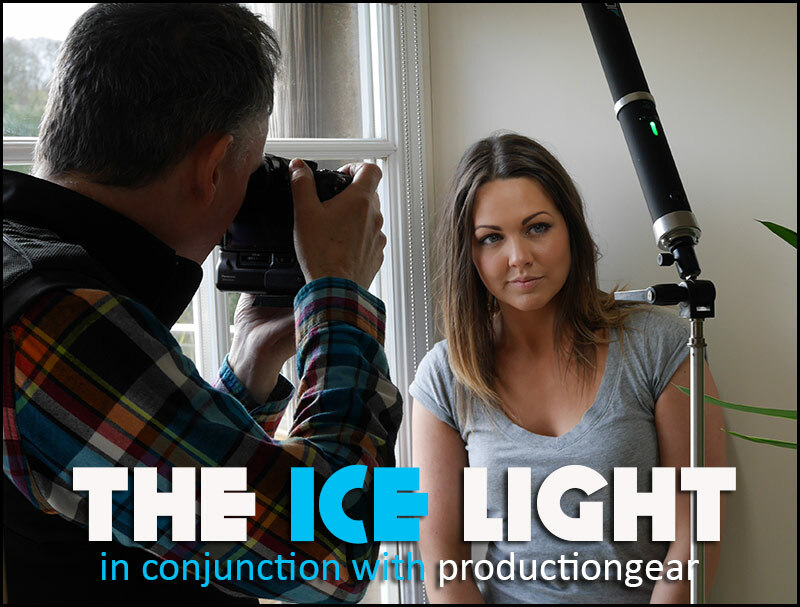 The ICE light is a major bonus for both photography and video work due to its diffusion and its ability to have a very low foot print…the ICE light is distributed by one of my site sponsors Production Gear. Just for the record I bought my ICE light just in case you think I got one for nothing. 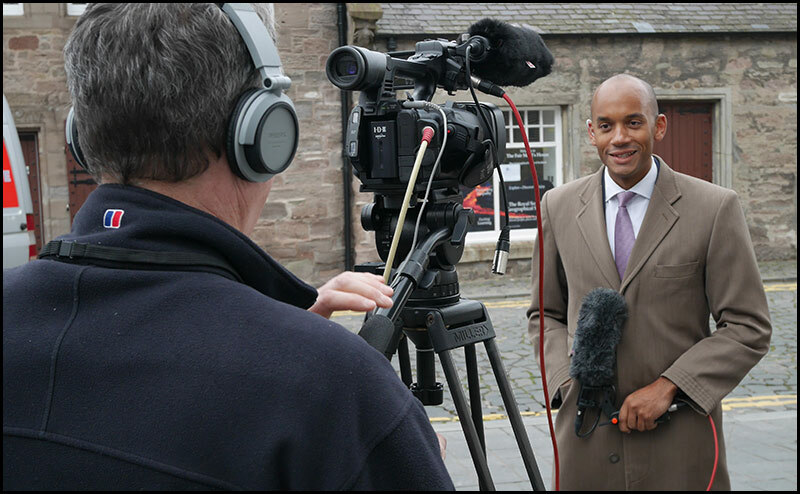 Got a call about one o’clock Friday afternoon to ask if I could get myself to Perth to film an interview with Chuka Umunna MP for Channel 4 news. First problem we encountered after arriving at Perth at 2.50pm was that we needed accreditation to enter the conference hall so we dashed over to a hotel about a quarter of a mile away through Perth town centre. Two lovely ladies dealt with our request very efficiently. 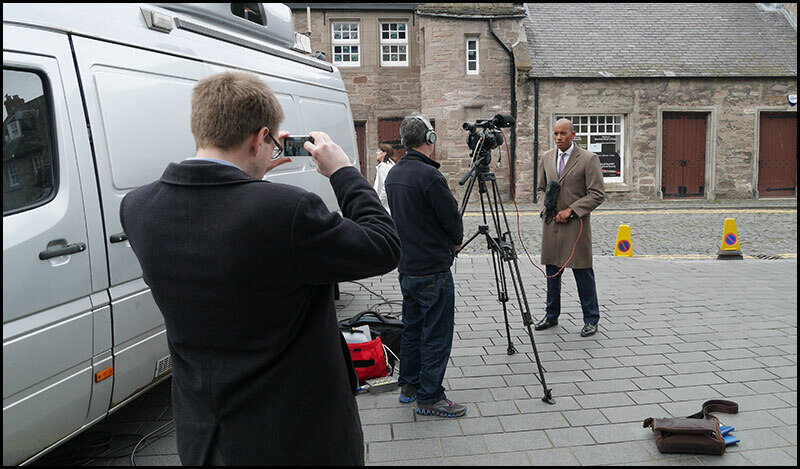 The yellow badge round my neck was our media pass to the conference but as luck would have it I decided to interview the MP outside the satellite truck. This was to avoid complications of doing any further cabling as after a certain time you were not allowed to run cable into the building, fortunately it wasn’t raining. 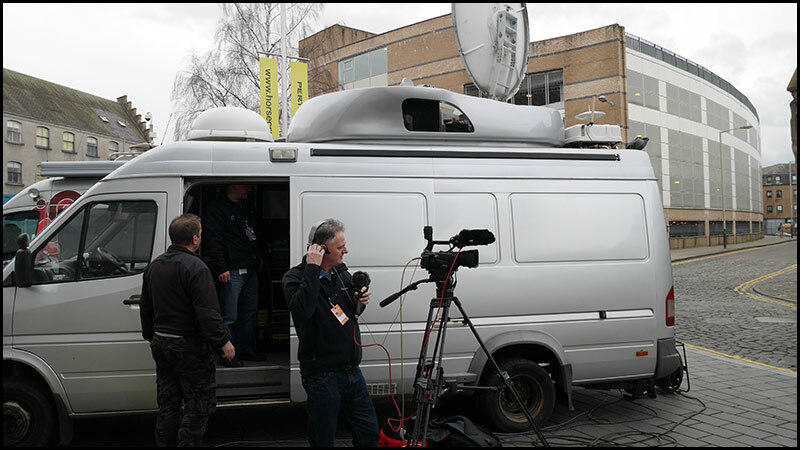 This is one of Scottish Televisions SAT trucks sending a constant feed back to STV in Glasgow, our pictures were routed to London. Using the JVC GY-HM650 I set the AV out via the HDSDI socket to 576i (SD) as STV can’t send HD via a SAT feed. As belt and braces I also fed two SDHC cards with two separate feeds…HD and SD just in case the feed via the BNC cable was faulty. This is one of the great features of the JVC 650 allowing you to feed HD or SD via the SDI socket. I wasn’t taking any chances so the Miller tripod came on this job, you can’t get any better plus the extra weight helped the camera from being buffeted by the wind. This was for an insert at 7pm about how the Metropolitan police has for the first time publicly apologised for the shooting of Cherry Groce, which sparked the 1985 Brixton riots. 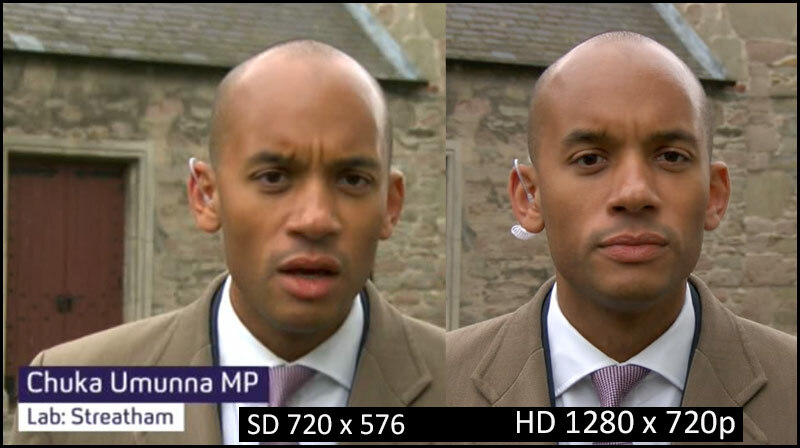 Chuka was a true professional and so Scott my son could get these photographs I got Mr Umunna to hold the Sennheiser gun mic. The Rycote softy was a real bonus today as it was very windy. As a comparison I took a still from my 720p SDHC card (Right) and a screen grab from Channels 4s output on SD (left), as you would expect the 720p footage is a lot more detailed. 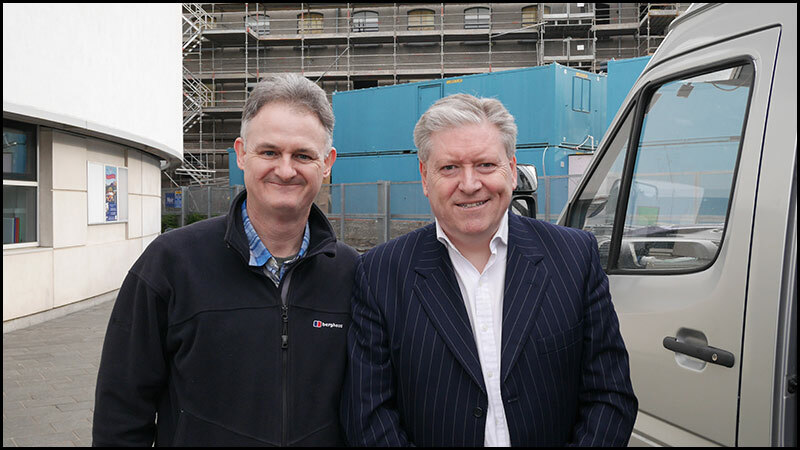 I bumped into my old pal Bernard Ponsonby a Scottish broadcast journalist working on regional news and current affairs programming for STV. Bernard and I had some good laughs many moons ago when I was a freelancer for STV news. Once again further proof that the JVC GY-HM650 is a great camcorder for ENG work but very versatile allowing various outputs and separate formats HD+SD, HD+WEB to be recorded at the same time. A great interview with Panasonic representative, Matt Frazer.